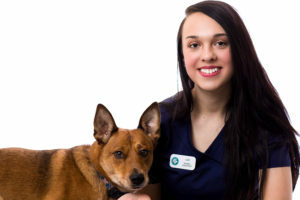 Our veterinarians at the Animal Clinic of Billings issue health certificates, travel certificates, micro-chip implants and city license for cats, dogs and other small animals. 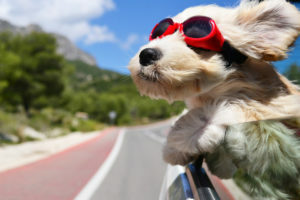 Traveling with your pet can be a lot of fun and is often less stressful for them than being left at home in a vastly different routine, and perhaps only “looked in on” a couple of times a day. Many of our clients do travel with their cats and dogs and we create hundreds of pet health certificates each year. For a list of pet travel requirements by country, go to the USDA website and select the first letter of the country you plan to visit. If you plan to travel with your pet, please let us know as soon as possible so that we can help you with the proper cat or dog travel exam and documents. 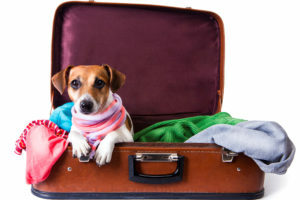 If you’re like most pet owners, you have either considered traveling or have already traveled with your pet, but found the experience to be stressful. The Animal Clinic of Billings wants to help make traveling easier for pet owners, which is why we’ve dedicated this page to pet travel tips. 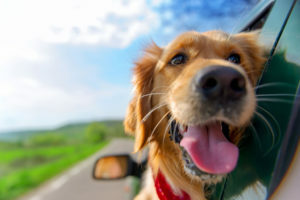 Whether you plan to travel by plane or in a vehicle—or both—these tips can help you and your pet have a safer, more enjoyable journey. Motion sickness is a common response for pets when they travel in a vehicle for the first time. If your pet experiences car sickness, an over-the-counter medication that is safe to give to dogs and cats is Dramamine (dimenhydrinate). For pets that need prescription strength motion sickness medication, The Animal Clinic of Billings offers Cerenia, an antiemetic that acts on the central nervous system without causing sedation. If your pet becomes anxious during travel, there are several all-natural remedies available that are veterinarian-approved, such as supplements that contain derivatives of casein (protein found in mother’s milk) and/or L-tryptophan. Royal Canin Veterinary Diet Calm also contains these all-natural calming substances, and, if fed starting a few weeks before travel, can help reduce anxiety in your pet. Adaptil for dogs and Feliway for cats have also been proven to effectively treat anxiety. These products are composed of a synthetic pheromone that mimics your pet’s own natural pheromones which provide a calming effect. 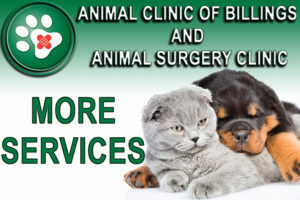 The Animal Clinic of Billings offers micro-chip implants, so if your dog or cat should ever become lost or stolen, any animal shelter or veterinary clinic can immediately identify them and who their rightful owner is. It is important to make sure that your pet is current on their identification before traveling. We recommend that your pet have both an ID tag on their collar as well as a microchip implanted. A microchip—which is about the size and shape of a grain of rice—is implanted under the skin, between the shoulder blades. Each microchip has a unique bar code that is then registered to that pet and their owner. Most veterinary facilities and animal shelters have scanners to help identify lost pets that have been hopefully microchipped. Proper identification can increase the chances of a lost pet reuniting with their owner. The Animal Clinic of Billings offers microchipping for your pet, which can be performed during a routine visit to our clinic. 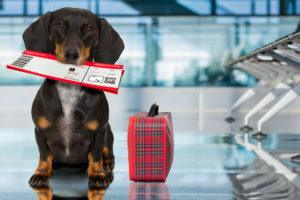 Before planning on traveling with your pet by plane, please check the airline’s pet policy to make sure that you meet the travel requirements. If your airline or destination requires a health certificate for your pet, the veterinarians at the Animal Clinic of Billings are accredited to issue both domestic and international health certificates. traveling to at-risk areas. A sedative for very anxious pets may be needed during long trips. Once your pet is examined, the veterinarians at the Animal Clinic of Billings can determine if a sedative is a safe option for your pet and discuss with you the best way to keep your pet healthy when traveling. Always choose a carrier that is comfortable and spacious enough for your pet, regardless of your chosen method and length of travel. As most airlines’ pet policies indicate, your carry-on pet carrier should be large enough for your pet to be able to stand up in and comfortably turn around in, but small enough to fit under the seat in front of you. Make sure the carrier is sturdy and provides sufficient ventilation as well. 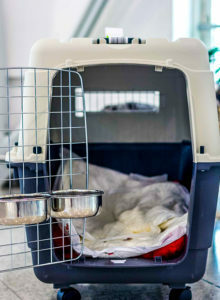 If you have a cat, consider the two following handouts for how to best prepare him/her for travel in a carrier. Let our highly trained and experienced team of veterinarians and veterinary technicians help you and your dog or cat with all of your health and travel certificate needs. If you need documentation to take your pet on vacation soon, please call the Animal Clinic of Billings to schedule an appointment with one of our veterinarians today!